Voltage testers are a must-have for professionals or do-it-yourselfers taking on electrical projects. They can literally save your life (Source). Before beginning projects such as updating wiring, replacing an outlet or installing new lighting, you need to follow safety procedures — including turning off the power. But mistakes happen. Voltage testers are the only way to guarantee that you don’t accidentally electrocute yourself. Most voltage testers work by measuring electrical current (Source) at two points on a circuit, but others detect electrical field that are created by alternating current (AC). Depending on your application, the voltage tester you use should deliver the correct sensitivity, durability, and ease of use. We evaluated a variety of voltage testers and combed through the specs to give you our top picks and all the in-depth details you need to know. 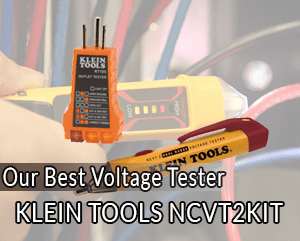 The KLEIN TOOL NCVT2KIT Basic Voltage Test Kit comes as a pack of two—a basic voltage tester and an outlet tester. Thanks to the polycarbonate plastic resin construction both have a lightweight design. The lightweight design facilitates convenience without compromising on durability. This is because the polycarbonate plastic resin is a durable material that does not break down quickly. 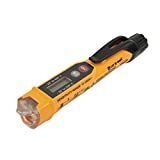 The voltage tester has a dual range which enables it to accurately detect voltage in cables, cords, circuit breakers, lighting fixtures, switches, and outlets. For the dual range testing, you can either select 12-1000V AC or 48-1000v AC. The tester will automatically detect and indicate low voltage 12-48V and standard voltage 48-1000V. The LED lights are used to get detection status. If after switching the tester on, it lights up steady blue, then it is in high sensitivity mode. If on the other hand, it lights up steady green, then it is in low sensitivity mode. When in high sensitivity mode (blue) it will pick up low AC levels and react accordingly. When in low sensitivity mode (green) it will filter out any low-level activity and only detect and indicate standard and high-level voltage. For more on how the tester works, ensure you go through the manual carefully, especially, if you are not an electrician. They both come with a pocket clip that allows for convenient storage and quick access. The tester has an auto power-off feature that helps conserve and extend battery life. It uses two AAA batteries which are readily available. Note that the tester is CAT IV 1000V certified and it conforms to all CE requirements. Also, bear in mind that the outlet tester requires no batteries because it operates using the volts from the outlet. The 2 for 1 combo ensures you get value for your money. The testers are durable and long lasting. The testers are highly effective in detecting voltage in a wide range of scenarios. 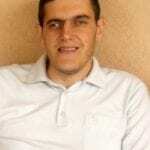 The testers are certified accordingly and therefore safe. Can be too sensitive at times. The biggest plus for the Milwaukee 2201-20 Voltage detector is that it is two tools in one. It detects voltage but at the same time can act as a flashlight thanks to the built-in bright LED. The tester is just under 6-inches in length which makes it small enough and easy to handle. The 2201-20 detects voltages between 50V to 1000V, and it is rated CAT IV 1000V which guarantees safety because there is no chance of shorting. It is made with standard ABS plastic which makes the tester durable and of high quality. It has a rear-mounted button which you press and hold to activate both the sensor and LED light. That the button is rear mounted makes it easy and convenient to switch on the tester. Once on, the green indicator lets you know that the tester is working and in perfect condition. When it encounters voltage, it will beep, and the light will go from green to red. Both the light and the beeping help ensure you do not miss any live source of power. The 2201-20 turns itself off after 3 minutes of inactivity to ensure you save and prolong battery life. However, you can also manually turn off the tester by pressing the button for about a second. It uses readily available AAA batteries. The tester also comes with a pocket clip which facilitates ease of access. To replace the batteries once they die, you need to push down on a tab that is located at the top of the pocket clip. After that, slide the black cover off, remove the old batteries and replace with the new ones. Note, however, that this is not an easy task. You might end up requiring a flat head screwdriver. The tester is durable and of high-quality and as a result, does not break down easily. The tester performs two functions which makes it efficient. Replacing the batteries is difficult and if not done right might damage the tester. The Voltage Tester with Infrared Thermometer is yet another Klein NCVT. The difference is that with this particular tester, you will not only be able to test the voltage, but you can also test temperature. It was specifically designed for HVAC (Heating, ventilation and air conditioning) applications. With regards to voltage testing, it will detect AC voltage in circuit breakers, cords, cables, outlets and so on. It detects AC voltage from 12V to 1000V, and it comes complete with light and sound indicators. That means whenever it detects voltage; it will light up and beep accordingly. It is thus efficient and effective. The Infra-red thermometer allows a user to choose between degrees Fahrenheit and degrees Celsius depending on what they are comfortable with. It has a range of between -22 to 482oC (-30 to 250oC). That is a big enough detection range for most HVAC applications. Note that it has a convenient laser pointer which helps target a 4:1 distance to spot ratio for the IR temperature. The LCD comes complete with a backlight and a 0.1 resolution to guarantee visibility and ease of use. Similar to most Klein Tools testers, this specific tester also has an auto power-off feature that helps conserve and extend battery life. The screw-thread battery cap fitted with an O-ring protects the batteries by being dust and water resistant. The tester is made from polycarbonate plastic resin which is a durable material and also lightweight. The lightweight and compact nature facilitate convenience, and the pocket clip provides quick access and easy storage. The tester is multi-purpose and perfect for HVAC applications. The tester’s LED display facilitates convenience. The tester is affordable but still highly efficient. The tester is extremely sensitive which requires careful handling to avoid false positives. Fluke is a well-known brand when it comes to the manufacture of electrical testers, continuity testers, and voltage detectors. 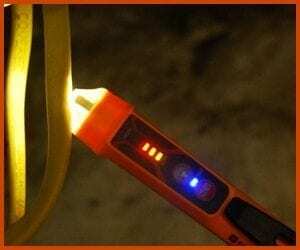 The Fluke 1AC-A1-II has a unique and patented Voltbeat technology that provides a continuous self-test. That means you will always know the tester is working. The Fluke is easy to use. You only need to touch the tip to an outlet, supply cord or terminal strip and if the tip glows red and beeps when the voltage is present. However, because it is a non-contact voltage tester, it also detects the steady state electrostatic field produced by an AC voltage. That means it will quickly sense the AC voltage through insulation without needing to touch the bare conductor. The tester is small and compact enough that you can comfortably carry it in your pocket. For safety and added protection, the tester is CAT IV 1000V certified. Depending on the model, it detects either 90V to 1000V voltage or 200V to 1000V voltage. Note that there is also a 20V to 90V control circuit model available. The unit comes with two AAA batteries, and the typical battery life is often more than one year. Note also, that it is easy to replace the batteries once they die. Thanks to its ease of use, the Fluke 1AC-A1-II can be used by a wide range of people. They include electricians, maintenance, safety personnel, and homeowners. The tester is durable and long-lasting. The tester has a unique technology that makes it easy to work with because there is no need to keep checking if the unit works. There isn’t one model that tests for both low and standard voltage. An extra cost incurred when purchasing the different models. The Greenlee GT-16 is an adjustable non-contact voltage detector that detects both standard and low voltage. You adjust the sensor depending on the intensity of the voltage you want to detect. The detector comes complete with one 1.5V AAA battery and a lifetime limited warranty. The battery is readily available whenever you need to replace it, and it has a long battery life of close to one year. The warranty ensures you receive a high-quality product because you can always return it when it fails. The sensitivity of the Greenlee GT-16, thanks to its adjustability, ensures it can be used in a myriad of applications. The detector can be used for power wiring, lighting, thermostats, and any other low voltage circuit. The multiple applications make the voltage tester ideal for both professionals and DIY homeowners. Note that it can also determine breaks in a wire and also differentiate between the hot and neutral conductors. The detector has a frequency of 50Hz to 500Hz. That makes it versatile because different electronic equipment operate at varying frequencies. A power line, for instance, operates at between 50-60Hz while a variable drive operates at between 1 to 20Khz. The Greenlee GT-16 is S/US UL listed. That it is UL listed means it has met all the UL’s requirements and is therefore safe to use. In addition, it is CAT IV 1000V certified which adds another layer of security. The tester is durable and long lasting. The tester is sensitive enough. There are three significant types of voltage testers. 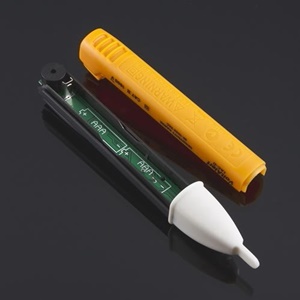 A two-contact voltage tester resembles a screwdriver. The lamp attaches at the middle; between the tip of the tester and a single lead projecting out from the tester’s back. When in use, the lead connects to a ground reference while the tip comes into contact with various points along the circuit. The advantage of this type of tester is the ability to determine the presence or absence of voltage at every point in a circuit. The disadvantage is that you are dangerously close to live circuits. That exposes you to electrical shocks and short circuits. A bit of an upgrade from two-contact but still unsafe. With a one-contact voltage tester, only one side of the circuit under investigation is contacted. The tester then relies on your body to act as the earth and complete the circuit. The disadvantage of this type of tester is once again exposure to shock and short-circuiting faults. While the external construction of the tester is supposed to protect you from this, that protection is not foolproof. Also, a shaft can get exposed, or the internal construction might fail. Also known as NCVTs. As the name suggests, you do not need to come into contact with a live circuit. The testers detect the changes in the electric field around any object with AC. They have a myriad of benefits such as the lack of exposure and ease of use and minimal to no disadvantages. From the information above, something shines through; NCVTs are the better option. That is why the above list of the best voltage testers only consists of non-contact ones. A professional might already understand these types of testers in-depth and instinctively know which one to pick. However, for non-professionals, it is vital to understand them before making a purchase. That way, you will select the right one that will not cause accidents or worse. The quality, durability, and effectiveness of a voltage tester, largely depends on the brand. The more reputable the brand, the better the testers. Well-known and respectable brands include Klein Tools, Milwaukee, Fluke, and Greenlee. Make a point to always go for a reputable brand because chances are high you will get a good product. It is essential that you be very clear on what you want to use the tester for. Once you do this, pick a tester with the appropriate voltage range. If you want to detect low voltage but then you end up purchasing a detector that only detects standard voltage (48V to 1000V) then you lose both your money and time. A voltage tester is not something you can purchase without due diligence. A single mistake can be the difference between life and death. Other than the considerations noted above, make a point of doing further research, particularly, the safety precautions. Once you do so, you will be ready to purchase the tester that suits you best and begin using it without issue.